This is the Tattoo effect from LunaPic and I think it looks great! I asked Mum if she would have this tattoo on her body. She said she isn't keen on having a tattoo. She doesn't mind them on others; she just doesn't want any on herself. To be honest with you, I think she's scared of having it done. Do you have a tattoo of any of your pets? If not, would you like to have one? 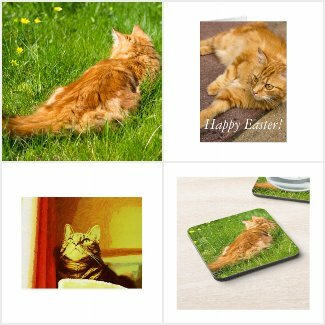 Check out the Spring Collection at Zazzle! I'm scared of having it done too but would love a small paw print on my wrist or something. A digital tattoo is probably the smartest way to go! Beautiful effect. I've considered a tattoo on and off, but never followed through. 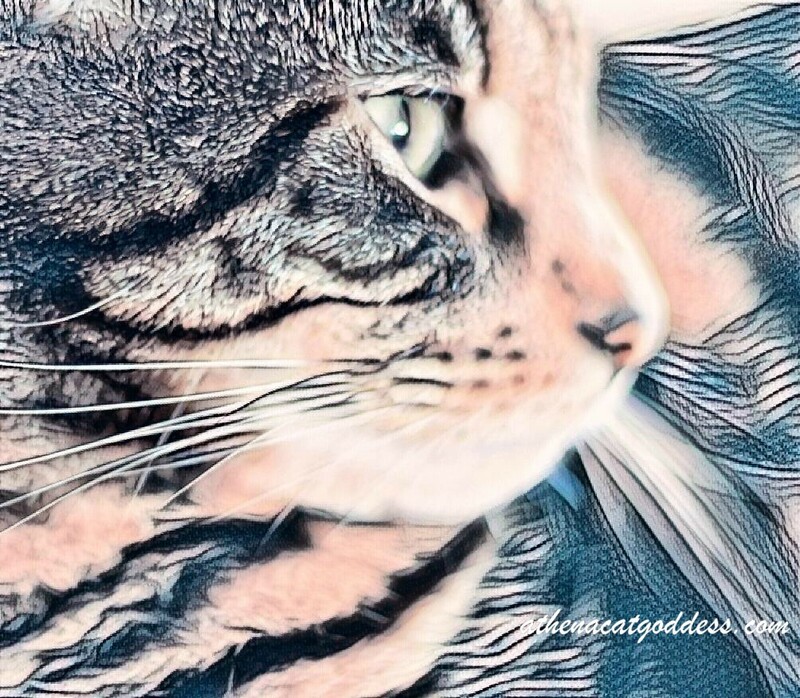 I'm really enjoying these caturday art link ups, they're just a really fun, no pressure way to combine cats and art. Please don't ever stop them! My human has a tattoo on her back right shoulder... she wouldn't ever have a pet tattoo, though. She's more into personal symbolism. That is gorgeous! No tattoos here. M's too chicken and "too old" she says. Maybe I'll go over and try that right now for the Caturday Art. Sorry to be a copy cat, but our pictures will be different and I'll mention that I had seen yours first. Athena, you're gorgeous girl! A real beaut. Mommy really likes your picture but she said NO NO NO tattoos. It's a shame really we had our claws all ready to dip in ink and get creative. This is yet another gorgeous image of you, Athena! This here human doesn't have any tattoos, and I doubt I'd ever muster up the courage to get one. If I did, it would most certainly be a small little statement of my love for animals. Thank you for hosting this always fun blog hop, Athena! No tattoos! I can't imagine volunteering to let someone poke me with a needle! No Tattoos here either but that sure is pretty! Mom says she really would like to have a tattoo of Abby's name on her but she is too chicken to go and do it. Pop says why mess with perfection. That's why he doesn't have a tat. Yes, that sounds like a lovely idea to remember a beloved pet. I can just picture that scene! Your mom is cool and brave! My momma duzn't trust anyone enuf to tattoo her. You look gorgeous in any form Athena! Happy Caturday yesfurday! Athena, you always looks beautiful. The mom was running around all day picking up metal stuffs to raise money fur us kitties and then her helped a purrtee kitty gets her mew home. We am finally visiting our dear friends... -Purrz from Katie Kitty Too.